Victorian Building set on Oban's Esplanade. 1 Family en-suite room, 5 Double en-suite rooms and 2 twin en suite. One double rooom en suite, one double room with shower and one twin room with shower. Benderloch is 7 miles N. of Oban. Brand new purpose built luxury Bed and Breakfast set in a beautiful location with stunning views, between Oban and Appin. 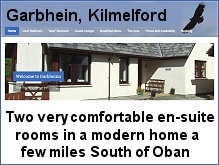 4 Star Gold Guest House, 5 minutes from Oban with views over the Firth of Lorn and Morven Hills. Six newly refurbished accommodation rooms available in this 16th Century castle 9 miles N. of Oban. Tariif £90 - £120 pppn. Licensed for civil weddings. 3 miles S. of Oban overlooking Loch Feochan. Three doubles, one twin and a triple, all en-suite, plus a single with private facilities. In a quiet, relaxing hillside location a short walk from central Oban. All rooms en suite, two with four-posters. Landscaped gardens. On Corran Esplanade. STB 3 star rating, 3 diamonds from the RAC and 3 diamonds from the AA. All rooms with private facilities. Family run Guest House situated in a quiet residential end of Oban's main street, offering modern facilities with traditional values. Grand Victorian property 20 miles N. of Oban. Well appointed, elegant country house atmosphere. Spectacular garden. Very comfortable modern home, nestling at the head of Loch Melfort, 14 miles South of Oban on the A816. Two well-equipped en-suite double rooms. En-suite rooms with digital tv's, free wifi access, tea/coffee making facilities. Near town centre witih parking. Beautiful Victorian House on Oban's sea front with spectacular views of Oban Bay and Islands.